Madrid is so captivating with its vibrant lifestyle, historical highlights, and cool hidden gems! 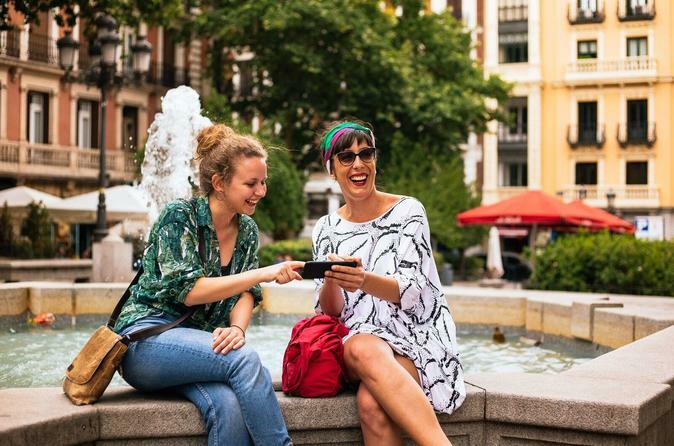 Get the most out of your stay and kickstart your Madrid city trip with a local insider. Meet your private guide, stroll through Madrid’s colorful streets. Admire its highlights and get all the tips & tricks that you need to have an unforgettable experience. During your tour, you and your friends will get all the answers to your questions and the best recommendations from your local guide. Meet your private guide in Plaza Isabel and kickstart your tour with an intriguing story about the queen’s life. Walk through the city together and wander past The Royal Theatre Opera, Plaza de Oriente, and the stunning Royal Palace. Hear all about Madrid’s history and enjoy the local insights from your local host. Stroll through the charming plazas of the city, check out a local market and get a glimpse of the local lifestyle. Wondering about the best places to grab a bite and have some drinks? Get your personal recommendations from your local guide. They’ll show you where you can find the best churros, the oldest restaurant in the world and where to recharge your batteries. Of course, you won’t miss Plaza Mayor, Madrid’s main square. You and your friends will be amazed by Puerta del Sol’s buzzing atmosphere. The square is known for its restaurants, cafes and it’s the place where you’ll end your tour. The tour is exclusively for you and your family or friends, to help you kickstart your experience in Madrid on the right foot!